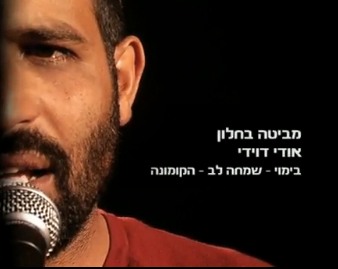 Udi Davidi has just released a brand new music video with music and lyrics by Udi Davidi. Directed by Simcha Lev, photo by: Amiti Eisenberg, lighting by Omri Botbol and produced by The Commune. The first song that I ever heard from Udi Davidi was this one a couple of weeks ago when I was in Israel and I went right out and bought his newest CD. I’m not that into Israeli music and this is really the only cd in that genre that I own, but this song in particular really moved me. Once I heard the other songs on his new cd as well I realized that it was a good purchase. Udi Davidi has quickly become my favorite Israeli artist. As an American Jew that only learned Hebrew in his 20s, and much of it through modern Israeli music, I have many “favorites.” Udi tops them all. May Hashem bless him with much continued sweet success to inspire Klal Yisrael. I was in Israel last week for my cousin’s wedding. She played Udi Davidi in her car. I’m hooked and I don’t even understand Hebrew.